(1967) – Turkish writer and journalist. Since her novel The Sea Shell Man was published in 1994, she has written over a dozen books, including novels, short stories, collections of stories, poetic prose, as well as a selection of political essays. 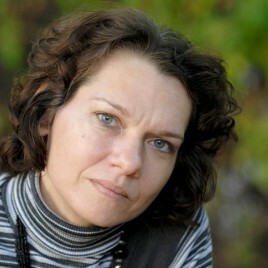 She has worked as a columnist and journalist – since 1998, mainly for the leftist newspaper RADİKAL and Özgür Gündem, a bilingual Kurdish newspaper she regularly works with to this day. In her books and articles, she takes on subjects such as state-sanctioned violence, discrimination and human rights violations. She has been a freedom activist since 1993, as a result of which she has been persecuted, fired multiple times and has spent over a dozen years in exile. She studied computer engineering (received her bachelor degree in 1988) and physics (master’s degree in 1993); she wrote her master’s thesis about Higgs physics in Geneva, where she worked as a high energy researcher at CERN, the European Organization for Nuclear Research. Later, she moved to Rio de Janeiro, where she began writing her doctoral dissertation; however, she gave up on her academic career in 1995. After a two year stay in South America, she returned to Istanbul and began her writing career. Her literary work, largely ignored in her own country has been the subject of over a hundred articles, essays and academic papers published in the leading newspapers and publications throughout Europe, including Lire, Le Monde, Frankfurter Allgemerine Zeitung, Die Welt, Neue Zürcher Zeitung, Die Presse and Aftenposten, as well asbeing analysed by such writers as Orhan Pamuk, Ingo Arend, Ruth Klüger and Eugene Schoulgin. The magazine Lire placed her on the list of “50 writers of the future”, naming her work a modern classic. Erdoğan’s work has been translated into many languages, including English, French, Italian, Swedish, Norwegian, Arab and Bosnian. Fragments of her prose have been staged in Milan and presented in the theatre. One of her short stories has been adapted in a film in France.